Run by American born, Lola Jones, this meditation retreat in Germany is also run in Santa Barbara, California and Somerset in the UK. Lola has had many careers including motivational speaker and consultant to companies like IBM, painter, writer, musician. Spoken in English, the course is translated into German by her assistant Gabriele Kingwill. Gabriele translated Lola's book Things are Going Great in my Absence and has been responsible for building a large following in Germany. There is a book you have to order when booking and the preparatory learning from this book and the web site has to take place 3 months before attending the retreat. This is a silent retreat and so the normal rules apply of no speaking, passing of notes, signalling. No electronic gadgets etc. I am not sure how this works in a busy hotel with other seminars going on in the hotel at the same time. She also encourages you to wean yourself off dependencies and sends you her First Aid Online Course to help you kick your habit whether it be tobacco, weed, anti-depressants or alcohol. 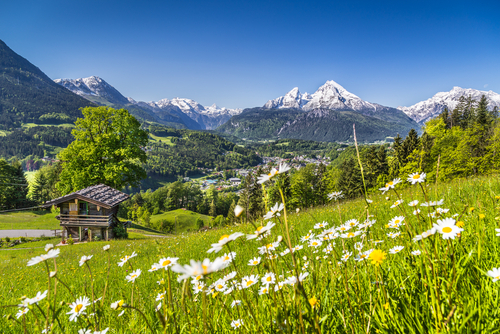 The venue is the Jonathan Seminar Hotel in Chieming near Traunstein very close to the Austrian border and the Austrian city of Salzburg so the Bavarian alpine mountains are shared with Austria and are exceptionally beautiful. So you fly into either Munich or Salzburg if coming by air. The hotel is near to the Chiemsee lake another gorgeous paradise for retreat goers. The food is gourmet and there are 3 dining rooms. There are hot air baloon rides and suanas or jacuzzis when not meditating. The tuition fee for a 5 day retreat is $1,950 and the accommodation is separately booked and the hotel offers room and 2 meals for 30 euros per person per night with the ability to extend your stay before and after the retreat. You really have to read the reviews on the web site raving about this retreat. It would appear that Lola is a rather special divine human being with exceptional gifts and this is one of those life-changing experiences that is going to leave you transformed. Lola talks about an awakening, opening up relationships, health and mental well-being and enhancing healing powers. Meditation becomes easier, deeper, faster. The retreat carries on after the course with Lola's bliss maintenance course where Lola will help you find your own inner power. She teaches people to raise their vibrational frequency and then hold it at that high level. She describes it as a way of life. She wants to teach people to discover their own inner power and continue their own development throughout life. The divine openings course is not aligned to any religion or philosophy and so would suit those who are seeking a more open thinking based on energies and inner healing.